Riot police stand guard in front of a fire during clashes with ‘yellow vest’ protesters, Montpellier, March 23, 2019. The French government deployed armed soldiers across the country over the weekend to prevent more rioting and looting that marred last week's rally in Paris. However, the government's decision prompted criticism over whether the soldiers are suitable for this activity. Several thousand soldiers from Operation Sentinelle, a French military operation deployed following the January 2015 deadly attacks, operated under strict instructions with an authorization to shoot, if they came under life-threatening attack during Saturday's 19th round of weekend "yellow vest" protests. About 6,000 police officers were deployed in the capital Saturday and two drones helped monitor the demonstrations. French authorities also deployed soldiers to protect sensitive sites, allowing police to focus on maintaining order. That decision prompted criticism from opposition leaders and some protesters. "Since when do soldiers face a population? We are here in France. You would say that we are here in [North] Korea or in China. I never saw something like this," said Christelle Camus, a protester from a southern suburb of Paris. French President Emmanuel Macron was under pressure to avoid a repeat of last week's rioting on the Champs-Elysées, where over 100 shops were damaged, looted or set alight. The Paris police chief was fired just a few days later, and his replacement Didier Lallement warned Saturday that his officers would move to "immediately end any violence or destruction." "Our instructions for firmness... enabled order to be maintained and prevented things getting out of hand," Interior Minister Christophe Castaner said. Clashes broke out in the protests in French cities Saturday. Tensions erupted as small clusters of masked protesters set garbage cans on fire and threw projectiles as they moved toward Republique Plaza in eastern Paris. Helmeted riot police fired volleys of tear gas in response. Elsewhere in France on Saturday, small groups of demonstrators and police clashed in the southern French cities of Nice and Montpellier. Dozens of people who defied the ban at Nice's Garibaldi Square near the port were quickly surrounded by security forces and later evacuated, with 75 people arrested. This week, the French government estimated that 40,500 people took part in protests around France, up from 32,300 a week ago. This week's protests were more spread out, with just 5,000 estimated in Paris compared to 10,000 last Saturday. Some 233 people were arrested, including people trying to come to Paris to protest with baseball bats, slingshots and other potential weapons, Castaner said. At least 2,000 people have been injured in protest violence since the yellow vest movement began in November, and 11 people have been killed in protest-related road accidents. The yellow vest movement originally started against fuel tax hikes but has snowballed into a wider revolt against a president and government accused of being out-of-touch with ordinary people. The riots were among the worst violence the capital has experienced since the 1968 student uprising. 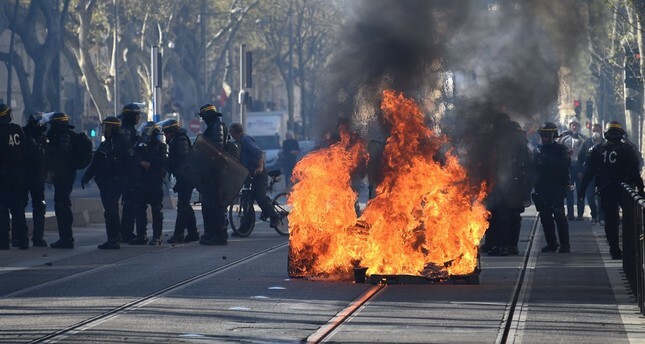 Violent clashes with police have persisted on the fringes of weekly marches in Paris, Toulouse, Bordeaux and other cities.